Doing my normal clean out in the freezer I found 1 piece of filet tenderloin and 1 piece of bone-less chicken breast. I also had a few onions, red pepper, yellow pepper and a cubinelle pepper. Of course, Fajita's screamed out to me. 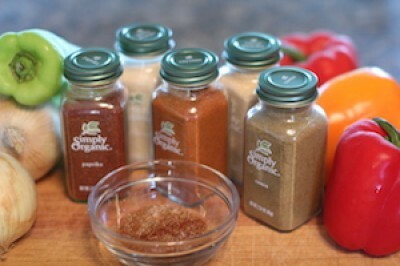 The first thing my husband said is; "we don't have any fajita seasoning" Um honey, we have Simply Organic spices. I will make my own seasoning. Yummy dinner at the lake for the 2 of us. Combine all together in a small bowl and use to season your steak, chicken or even seafood. Enjoy your Fajita's! This was our yummy dinner! Cindy's Tip: To cut the steak and chicken really thin freeze for about 30 minutes.